Sound has always been important to me. In whatever context, movies, television, music, the quality of the sound makes or breaks it. I refuse to watch most movies until I can view it in a surround sound set-up. Terrible movies will still get multiple views from me if the audio saves the experience (Tom Cruise's War of the Worlds is an example). So whenever I could, I would make sure my gear is giving me the best sound reproduction possible, even with my limited budget. 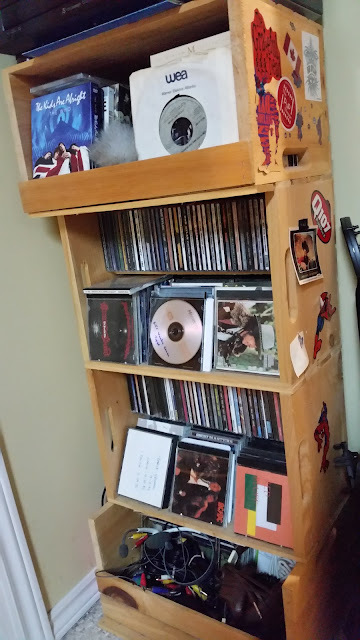 I have a few different set-ups through the house, depending on what the room is being used for, or source that is being heard. Lets start the tour on the main floor living room/family room. Normally hooked up to a record player, the living room amp is also ready to take audio from an ipod/phone or tv. 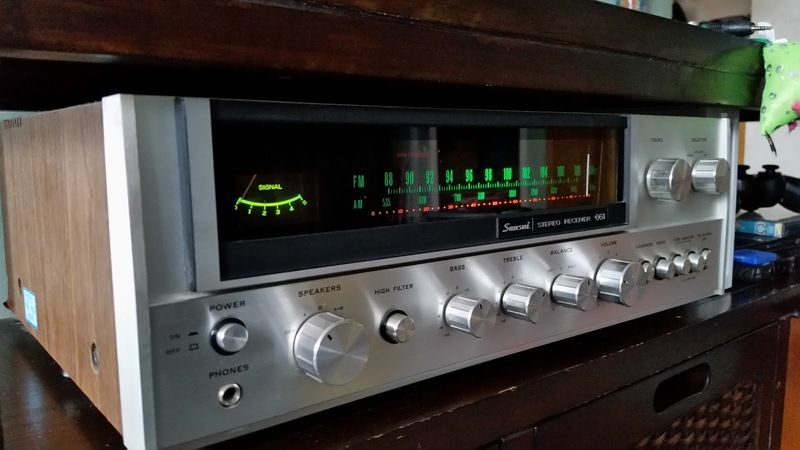 Tucked in nicely is the woody Sansui 661. This baby was made sometime between 1971 and 1976. The great thing about quality audio components is that older often means better... as long as your capacitors don't dry out. 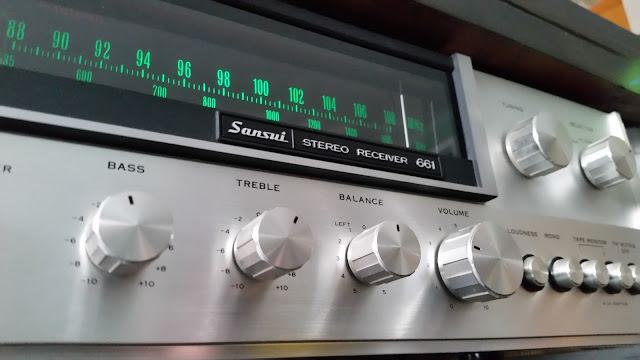 While the Sansui was know for extremely high end options, this was their first receiver priced at a level for more consumers to afford. Original retail price was around $350 US in 1971 (around $2000 in today's dollars). 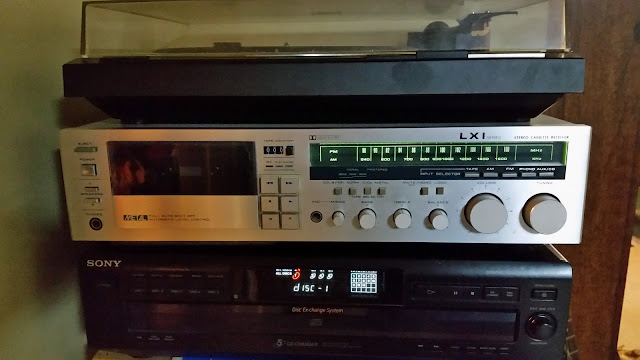 I was lucky to find it at a flea market, sitting in the grass under a pile of newer amps which the dealer thought were worth more. He was wrong. I snapped it up untested for $10 and never looked back! 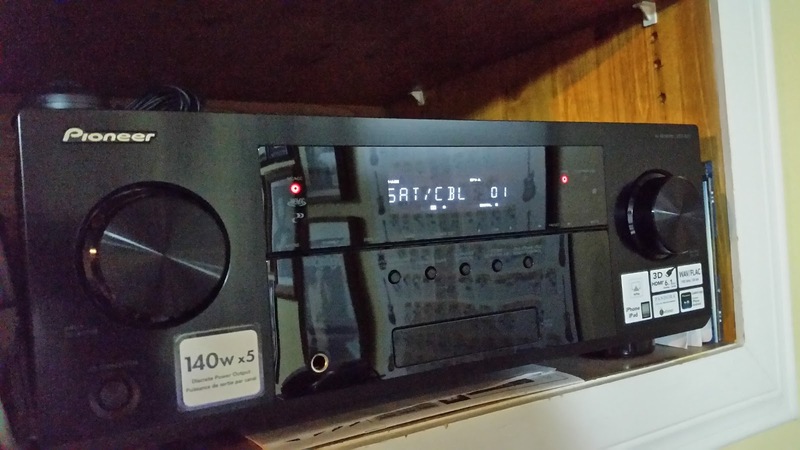 A receiver of this tonal quality requires some special speakers to go with it, hopefully of the same vintage. The speakers were the next lucky find. 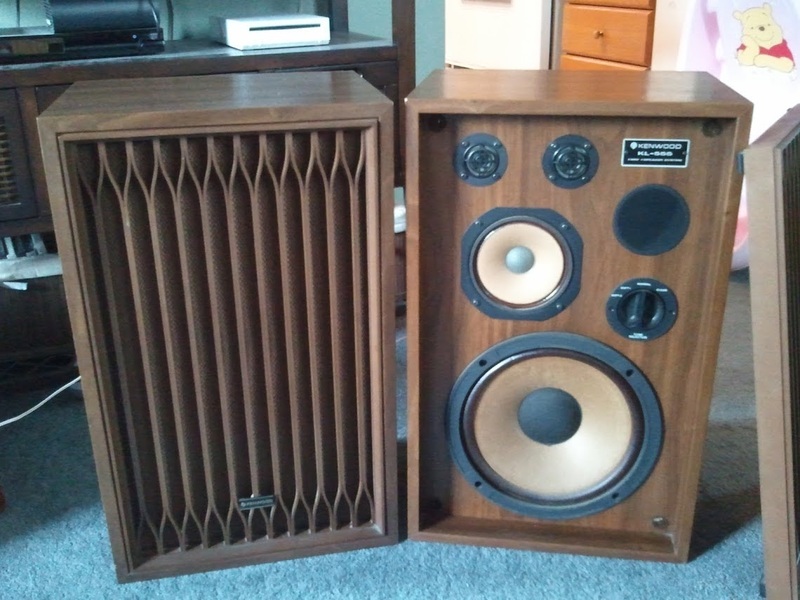 Orphaned and covered in scratchy dust, the perfect speakers were found at Goodwill. These Kenwood KL-555 (Made in Japan) were $10 and I grabbed them strictly to resell them for a quick buck. They were too big for our room and looked pretty dirty anyways. Well, a rub of Murphys Oil shockingly restored these to new condition and after a test with the Sansui...they just had to stay! Space be damned, it was a perfect marriage of sound. 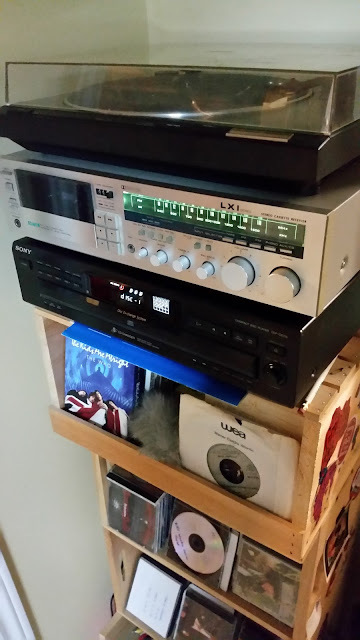 Moving on down to the basement we have another turntable listening station although these components are mostly from the 80s, except for the CD changer. They sit on my custom design, apple box shelf stand. The amp used here a Simpsons/Sears branded LX1. It holds up quite nice although the cassette drive no longer functions. 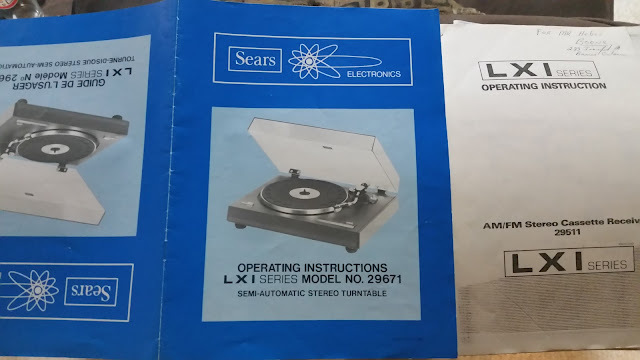 Sears would contract out the builds of their branded components to various manufacturers throughout the world including the likes of Marantz, Pioneer, Sherwood. This unit is most likely built by Sanyo but the model number doesn't match any convention noted on the internet. It has a great build quality, very heavy and never heats up. If you can find any other info on it let me know! 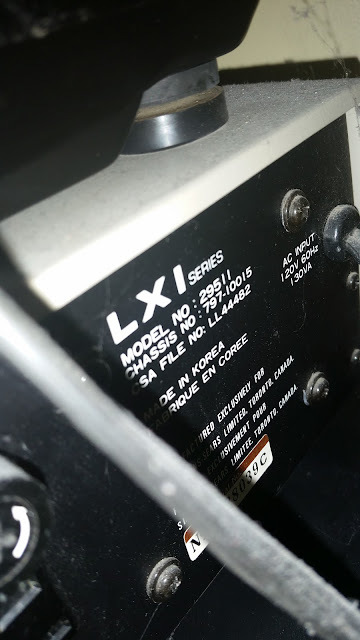 I stored the LXI record player that came with it. Although made in Japan, it was just a regular, no frills belt driven turntable...the belt long overdue for replacement. Instead I added a direct drive Pioneer with auto-start, which is so much easier than dropping the needle yourself! I can't remember where I aquired the Pioneer, but the Sears components were bought from the original owner at a yard sale for what must have been under $20. Included was the amp and turntable's instruction manuals, schematics, and original bill of sale! 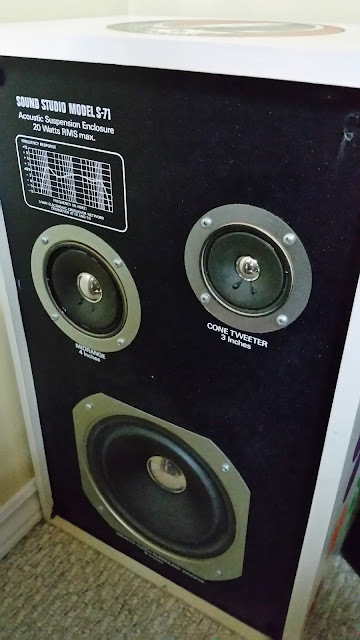 The speakers for this tower of power were pulled out of my father's workshop. 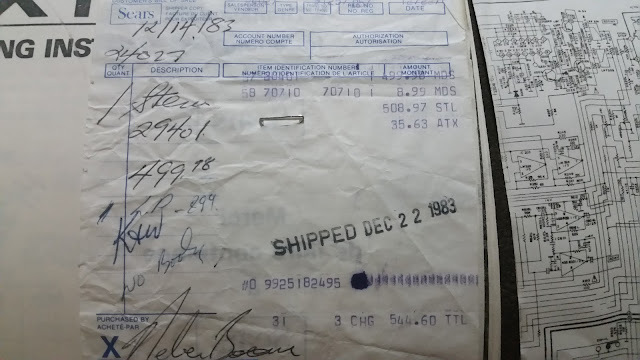 He had picked up 4 of these in the 80s from somewhere....I believe they were sold out of Sears as well. I took two of them to give them a better life. 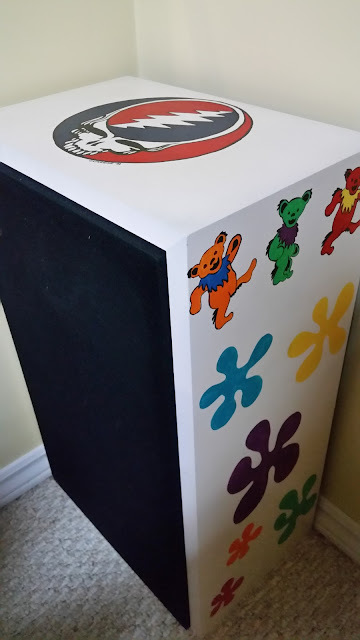 One even received a custom Grateful Dead paint job from my wife! Now we switch to the digital side of the basement. This is the only amp I've constantly upgraded through the years to keep up with the video technology attached to it. Early on you just needed an amp with a couple inputs but as tech changes, your amp becomes your hub for all your sources. First I had S-Video jack fields with only one optical and one coaxial audio input. This required a separate optical audio switcher to accommodate all the digital inputs, Then I upgraded to component inputs amp, then finally an HDMI capable amp. Since audio and video are carried through the one cable, this solved a ton of switching problems. I had always stuck with Pioneer amps here. They are capable, powerful and affordable. 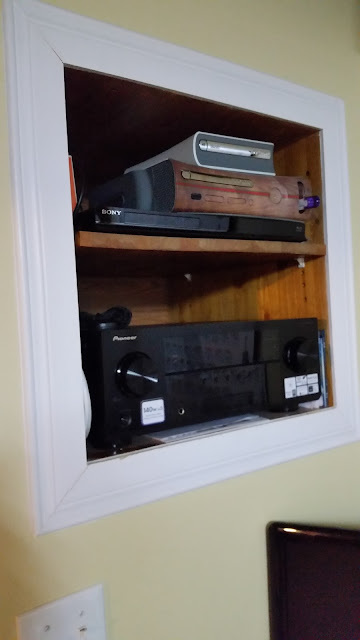 The amp, blue ray, Xbox 360 with HD-DVD drive all live in a built in under the stairs. All cabling and power hides in the storage space behind it, with cable runs coming up and out through the ceiling to the projector and overhead mounted speakers. 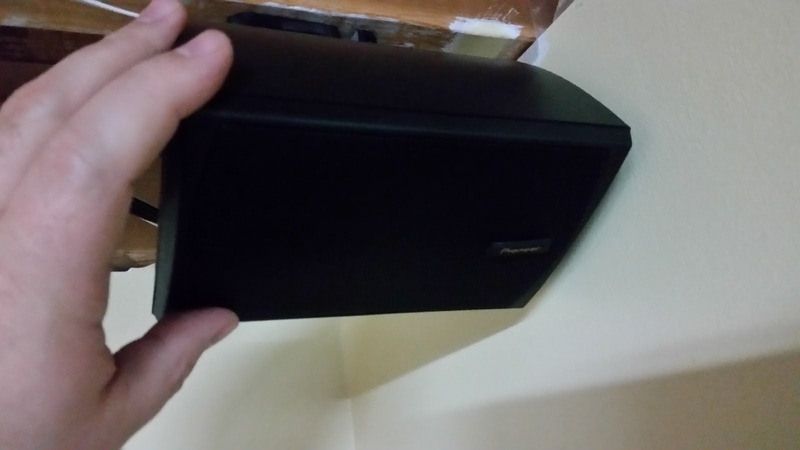 The house's one satellite receiver is also out of sight in the storage area, accessed via UHF remote and feeds the living room and basement though it's dual HD outputs. 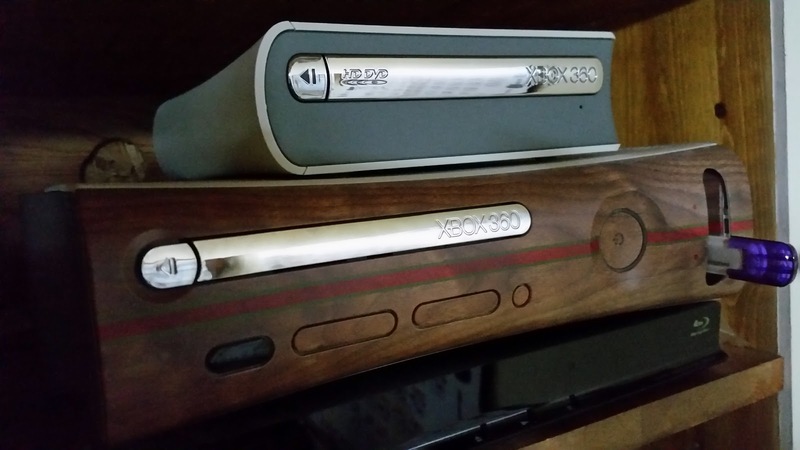 The woody Xbox gets the full surround treatment although this makes scary video games too intense for me to play! It is insane the sound that comes out of these little guys. 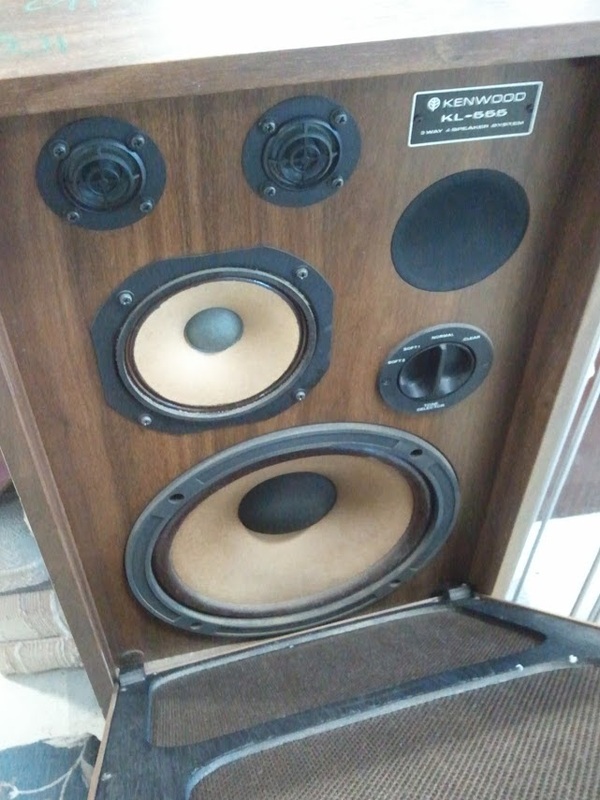 Even though I've upgraded amps several times, these are the original speakers from the first system. Not pictured is the 100w Sub woofer that fills in the low frequency. It's quite effective at pounding your chest when the bombs are dropped in Saving Private Ryan. 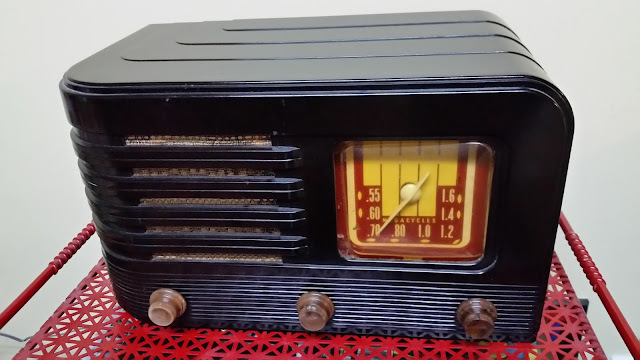 Finally, a standalone...The 1941 Stromberg-Carlson Canadian Bakelite vacuum tube radio. She is a true beauty and still fires up. I love the Art Deco lines. That's it....pretty much. There is another record player/radio cassette combo set-up in the garage/work bench area, but certainly nothing fancy enough to write about! Just keeps me company when working away in the garage. This post goes out to my Captain, @CartridgeCanuck who requested the tour. 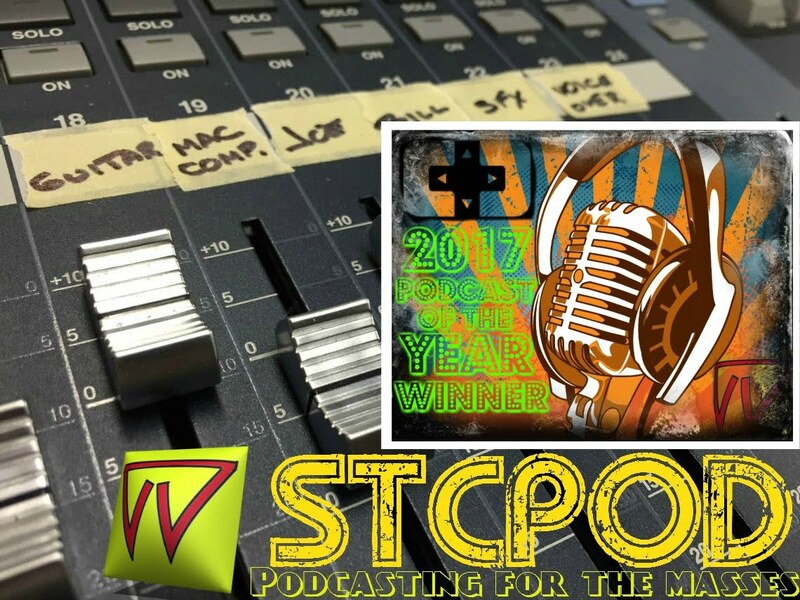 Thanks for checking this all out, feel free to leave a comment below and don't forget to try an episode of our weekly podcast STCPod.